Getting James to smile has become a competition around these parts. As you can see, James only has smiles for one person. OMG!!! So CUTE!!!! All your kids have the BEST smiles!!! Thanks for sharing!!! Love it!! haha I can definitely relate! I have a 6month old little boy and no one can make him laugh or smile more than his 3 year old sister! its beautiful to watch!!! He is so beautiful! Totally adorable video! I just love Annie’s excitement over James. Of course he will smile at Annie – she makes EVERYONE smile. Hands down, you guys make the BEST family videos!!!! I can never get enough of them and this one, in particular, too darn cute! By the way, I so want that red mask Heather wore – OMG, I totally j’adore it!!!! This is hilarious. Can I be a part of your family? For serious. Sooooo gorgeous!!! Our 16-year-old Jimmy (James) is currently GRINNING because his team, North Melbourne, finally won a game!! Whooowhoooo!! Over Geelong, one of the top teams in AFL!!! Thta was so stinkin cute!!! Too cute!!! 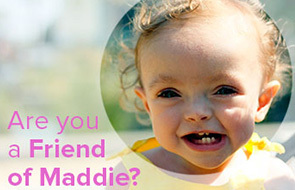 That baby is the perfect mix of Maddie and Annie. Adorable in every way!!! Oh so adorable. Annie has the most precious voice! James has such beautiful eyes! He’s such a cutie. Eeee! I love this! You guys! Awww, so sweet! What a fun video! And very well done! So cute!! And I love your couch, where did you get it? Adorable. Another absolutely great video! OMG how cute he is. No wonder he smiles for Annie. He knows another cute kid when he sees one. You guys are AWESOME and you make the cutest children! Such a cute video. And James, too. And, of course, Annie and Rigby. I just keeled over from all the sweetness and cuteness of and Annie and James. Ok, he is seriously like the cutest baby! And I am NOT someone who says that about every ole baby on the block, so you can trust that it’s just the objective truth!! Love him! That is such an adorably cute video! So sweet! One of your best! You all look amazing! The video was adorable, but I mostly wish I had watched you film it because I bet you looked like crazy people. James is one of the cutest babies I have ever seen, he has so much personality in his face. way too cute. You all look great!